Above: Nocturnal Ink Satin Eyeliner, resplendent in the afternoon sun. Rouge Bunny Rouge is one of my favorite beauty lines due to its gorgeous pigmentation, inspired packaging and enchanting aesthetic. From foundation to bronzers to lip color (and everything in-between! ), this European brand is simply stunning. When I received word that the line was soon to release a new installment of liquid liners, I could hardly contain my excitement. The RBR Feline Gaze Eyeliner is one of my favorite eyeliners ever and I knew that this fresh collection of liners would not disappoint. When night draws close in the Enchanted Garden, shapes are softened that were once so vivid in the day. The scattered light of waxing gibbous moon casts inky silhouettes of leaf and flower across the landscape’s shadowy cloak. Only then do wood sylphs appear as dainty and fleeting as humming birds, animated in one moment, absconded in the next. Over their translucent forms the ebony outlines fall, tattooing botanical images in lustrous nocturnal ink. In this curious rites of passage reserved only for the young, sylphs disappear before forest commandeers its precious etchings back. Displayed proudly, each unique graphical adornment is worn over the natural beauty of their skin. Thereafter revealed only when desired, as each has the power to summon or banish their illustrated beauty as wished. This ethereal moment in the garden of precise inky borders creating an otherworldly grace inspired NOCTURNAL INK Satin Eyeliner. Define eyes with complete precision, emphasising their allure, making lashes fuller. Luminous hues capture the sheen of a sylphs skin in a brilliant sateen finish while the unique slim, flexible applicator tip shaped like a brush, ensures unwavering strokes at all times. Your ultrafine or dramatic lines stay exactly where put yet can be instantly removed without trace, leaving the memory of your exquisite look etched in the mind forever. This first of its kind, non-staining eyeliner ink provides sleek, high intensity make-up that lasts all day. Quick drying, transferproof and with no smearing or smudging, precise lines are achieved that are even water resistant. Spot colour between the lashes on the lash line so they appear fuller and use this innovative precision liner with confidence, knowing its expert design ensures perfect results are effortlessly achieved. Safe and comfortable to wear around the sensitive eye area; Satin Eyeliner is both dermatologically and ophthalmologically approved. Dark Bay...a dark khaki brown. Blue Roan...a deep indigo blue. The felt tip is strong enough to impart a rich swath of pigment that glides over the eyelid with ease, yet delicate enough to be incredibly precise in the diminutive orbital area. The innovative formula dries quickly and is stalwart in nature...I haven't experienced an ounce of fading, flaking or migration; once it sets, it remains in place until it is washed off! The satin finish is utterly beautiful...it is subtle and sophisticated (rather than glittery) and gets more complex and multidimensional with with extended wear. Above: The Nocturnal Ink has an ergonomically designed grip at its base to aid with steady application. Above: It comes in three classic yet cutting-edge shades...Friesian, Dark Bay and Blue Roan. Above: Swatches of all three shades in direct sunlight. Above: To demonstrate their nimble writing capability, I wrote the initials of each shade name...notice the depth and gleam of the formula. Above: Friesian on the upper lids...it is a gorgeous gold-flecked charcoal black. Above: Rouge Bunny Rouge Nocturnal Ink in Friesian and lip color in The Plot Thickens, Tongue Tickles and Rahat Lokum. 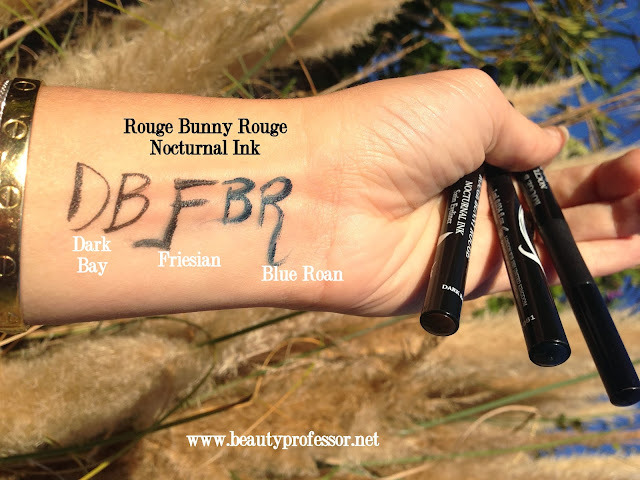 The Nocturnal Ink liner should be available in the coming weeks...I suggest monitoring the Rouge Bunny Rouge website and Beauty Habit for its arrival! Have YOU tried any Rouge Bunny Rouge products? If so, what are your favorites? **PR samples provided for review, however, as always, all of my opinions are expressly and unequivocally my own. Thank you for a wonderful blog. It's truly insightful and helpful. I wish to ask if you have any final thoguhts on the Armani Maestro Compact foundation? How would you compare the liquid to the compact and which would you recommend? I've been using the liquid since it's release. Which one is your favorite of Armani's foundation? My pleasure...thanks so much for your kind words! I still do like the Maestro Compact...it is luminous like the original Maestro, but offers more coverage overall. I find that with primer, the lasting power of both is commensurate and the moisture level of the compact is more pronounced overall. If you love the Maestro liquid, there may be no need to change. I, however, am partial to compacts and coverage, so it was the right choice for me! As Armani foundations go (and I've tried them all! ), I also like the Designer Lift foundation in #5...it is a good match for my winter skin. Hi Rachel. Thank you so much for this post. I had heard that RBR was coming out with these soon and I couldn't wait to see them. I have quite a large RBR collection (I'm obessed with them) and you are so right; everything they do is fabulous. I have a question. Have you tried these for tight lining only? I have hooded eyes and like you, when I'm wearing eyeliner on my upper lash line my mobile lid touches my upper lid. I have completely stopped lining on the upper lash line because it makes my eyes appear smaller. Tight lining has become my only method with eyeliner. From your demo, it appears that these would work quite will for that, so just wondered if you had tried it. BTW, thanks also for the tip on combining The Plot Thickens and Tongue Tickles. I own both of them and never thought to try that. They look great together! I am happy that you enjoyed this post and love that you adore RBR as much as I do! The line is just exquisite. In response to your question, yes, I have tried just tightlining with these and it works well. I love how lush and dark it makes the lashline appear. That being said, I haven't yet tried this formula with my lower waterline so I cannot weigh in on that yet...typically I embrace a pencil for this area anyway! Yes (and thanks! ), you must try the combination of The Plot Thickens and Tongue Tickles...it's one of my favorites! Absolutely phenomenal review...well detailed and very much appreciated! I just bought these from the beautyhabit sale. The blue was backordered and I got the brown on saturday. I tried it out today and found them incredibly difficult to work with. The ink like won't come out from the tip, you have to press a little and get it from the side. Because of this my eyeliner looks terrible today. Its splotchy and my wing is thick and terrible because I couldn't use the tip to make a nice precise line like I do with my lmdb liner pen. Did I just get a dud or is that how yours work as well? I'm thinking of canceling my backordered blue because this is useless to me. I am so sorry to hear about your experience with the this eyeliner...the ink in my liners flowed from the tip effortlessly...no pulling or dragging. I can only imagine that perhaps you got a dud because, like I say, my liners worked as they should. Have you contacted Beauty Habit about the situation? Also, perhaps it would be wise to email Rouge Bunny Rouge directly (I've had wonderful experiences with their customer service in the past) to explain the issue.